1. To enjoy oneself playfully or to indulge in pleasurable activities: There are many busy people who disport themselves on golf courses. 2. To play in a carefree fashion or to amuse oneself in a lighthearted manner: Little Jimmy was disporting with the other children in his class on the school grounds. 3. 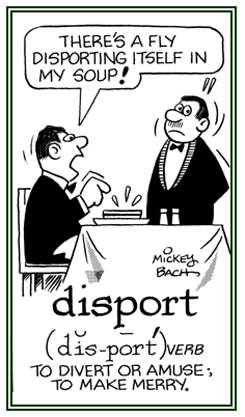 Etymology: from Anglo-French disporter, "to divert, to amuse"; from Old French desporter, "to seek amusement"; literally, "to carry away" (from serious matters); from des-, "away" + porter, "to carry"; from Latin portare, "to carry". © ALL rights are reserved.